So, real quick history on why we decided to buy a Jayco Seismic. We had never even heard of a Seismic in our years of looking at toy haulers. Cyclone made a model with a side patio and two full baths. Sold! Well… almost… We drove around one Saturday morning to a few dealerships looking for this particular Cyclone, but also wanted to keep our options open. After a few dud dealerships we finally went to one that we knew carried the Cyclone and had it in stock. Ready to sign our life away. Papers were signed a bit later and we were all happy campers that absolutely could not wait to hit the road! Let’s just divide and conquer with the features. We will divide into: Work, play, kids, dogs, adults, cooking, logistics. Easy enough, right? We’re starting with my absolute favorite part of the camper: the side patio. We use this regularly for work and relaxing at night. It has a TV and refrigerator (for night). Given there is a TV, there is also extra power for your laptop, phone, Bluetooth speaker, etc. Everything you need for work, right? Pretty views and fresh air make for one heck of a great work experience. Better than any cubicle. I really feel like Jayco built this side patio just for me, to change my whole world and make life 100x better than it was before. I’m totally serious. I LOVE working. I LOVE having my own work space. I LOVE being able to focus for just a few hours and knock out a whole days’ worth of work so I can go on a walk. When it’s really hot and sunny – meaning, uncomfortable and we can’t put the awning out – you can work inside. The tables in the main area are quick to set up and take down. Or, go to your master suite and close the real bedroom door and real bathroom door. 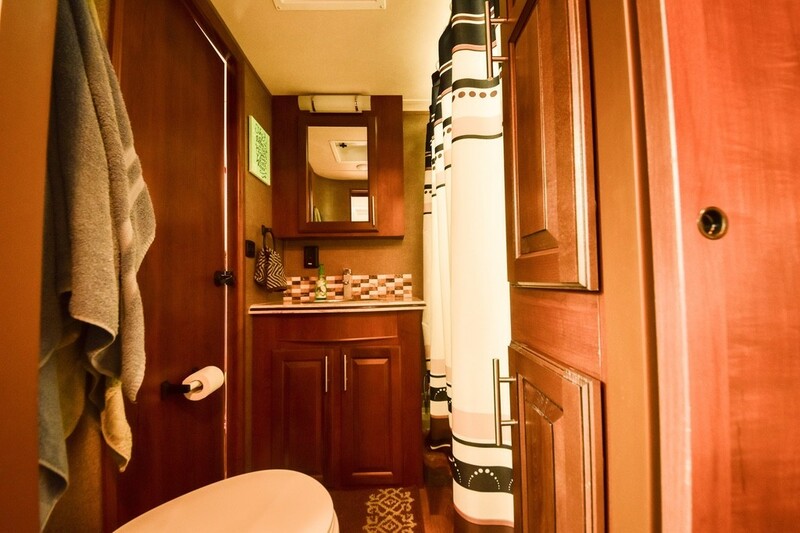 If you have a curtain in your current travel trailer, you can appreciate this feature. Any one like to fish? Anyone ever damaged a fishing pole in transit or when stored in the outside storage compartments? Please say yes. We have. There is a unique compartment on the sewer side of the RV. One that is so very easy to convert into a 7’2″ tall (2′ wide and 9″ or so deep) fishing pole only space where nothing will be damaged. We installed a few wall holders and now call it “the man cave.” Getting all of those fishing licenses in the states you visit is a whole other project. Now let’s move to the toy box (garage). Everyone has seen a motorcycle come out of that garage, right? It’s also a good area to store SUP boards against the wall, bicycles, archery bows, RC cars, a huge bag of random balls and cones for fields, Vespa/Ducati, etc. You won’t ever be bored a single day in your life if you pack right. The back patio is an absolute perfect platform for practicing archery from (if allowed in the park you are staying). So much fun. 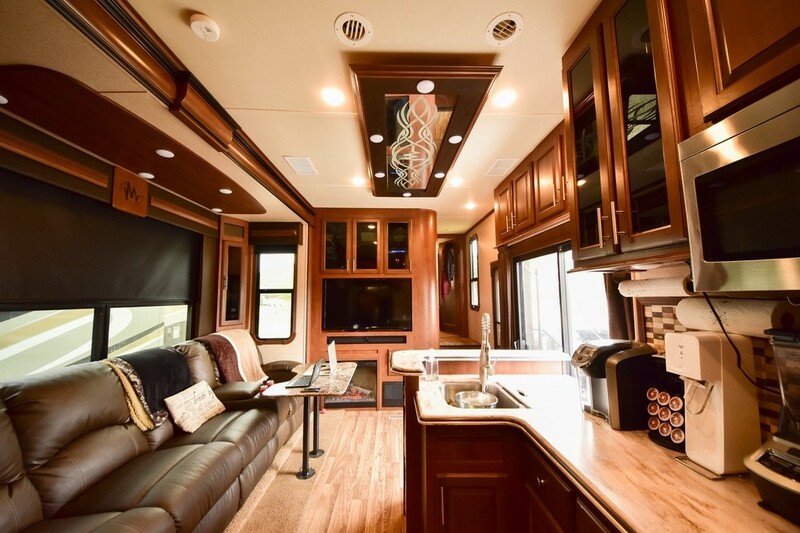 If you are spending time inside of your camper, the huge windows are absolutely amazing. So much natural light. Do I even need to say how great it is not to share a bathroom with the kids? It is SO VERY great not to share a bathroom with the kids! The bath area is nice because one of them can brush their teeth while the other is taking a shower or dressing. The kids have multiple spaces to spread out between the table area and the back patio. There is also a back awning, but like most parents: we discourage the kids from using it because… well… they are not to be trusted with functioning camper gadgets. The kids are typically not allowed on the adult patio. We have two for a reason. We share lots of moments together on the road, but we don’t need to share every minute together – especially in the evening. In the garage, the kids have a table and almost-sized king bed or two beds. It honestly is pretty hard for an adult to move through the table area to get to the back patio. The bottom bed is not all that comfortable, as you would expect. The top bed, in contrast, is better and huge. After attempting to make two different sets of queen sheets fit the top bed, we finally tried a king set and sure enough, it fit. However, have a queen comforter on top so it doesn’t hang over too much. You can’t tie them up outside; it’s against park rules. Even if they are well behaved, you can’t let them lounge in the sun without a leash and you holding said leash; it’s against park rules. You can’t put them in a small ground kennel because they dig; that may not be against rules, but it sure will get you in trouble. They also get very dirty in that little kennel; it’s a fair weather solution for an hour at best. The solution? Kick them out on the side patio! They love being in the sun. They are clean. This also gives the human adults a little time to clean without dirty paws leaving their mark on wet surfaces inside. They need just as much fresh air as we do. They also need space to stretch their legs, and though the patio isn’t huge, it sure is bigger than a small wire kennel on the ground. We love our dogs camping with us more than ever. No hassle or issues whatsoever. And plus, when you need to take a nap midday in your dark bedroom (because the shades work very, very well) you always have a cuddle buddy to ensure that nap is a good one. Do you ever leave your puppies unattended while you run into town or go on a half-day adventure? 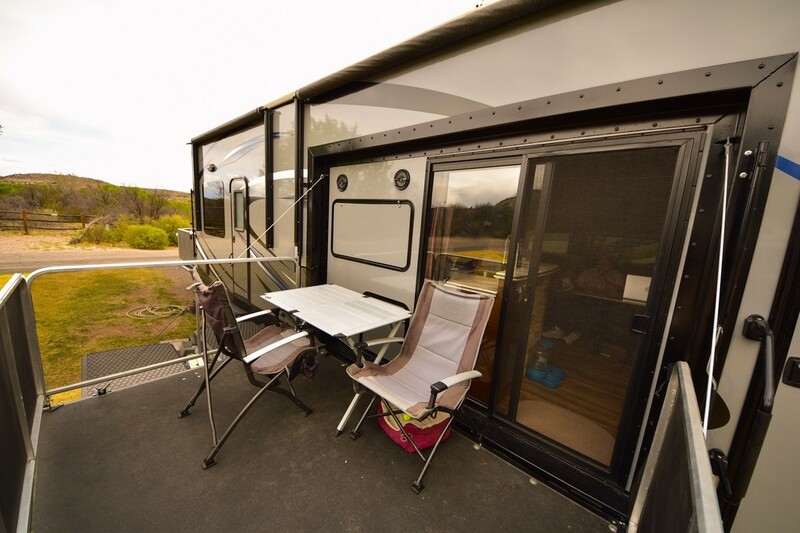 The camper is very easy to keep at manageable temperatures with the two vents and lots of windows to open for constant airflow. Your puppies won’t freeze or get too hot, as long as you are mindful. We have an 80 degree high temperature max when we leave the dogs alone for more than an hour or two. You have your own bedroom and a good sized bathroom. The bathroom has a signifiant amount of storage. We love that. 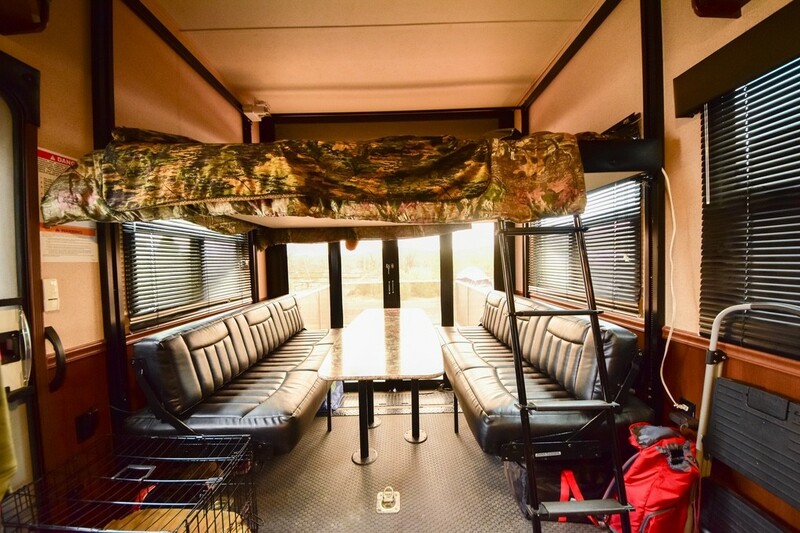 Enough room for plenty of extra toilet paper, two bath towels + two swimming towels for each person, extra bottles of personal hygiene, a huge first aid kit, etc. Room for all of the normal things you have in your stick and brick bath. The hidden TV in the bedroom that pops up is our favorite part of any tour we give. People love that and are always entertained. Also, this TV works well if you need a second monitor for any reason. The king sized bed is HUGE! It’s like you wouldn’t even know someone was in bed with you if you. The mattress is good for 4-5 nights before your back starts hurting. Which, in our experience is pretty good for an RV mattress. With that, I will say, we are strongly considering upgrading the mattress but going down to a queen. It would just be a little easier to move around the bed, especially when picking out your clothes every morning or making the bed. Each side of the bed has power, but you will need a power strip. Are we the only family that needs 4 things charging per person every night? My husband is typically the chef, but I do like to help out. On nice days. And only when I can cook on the side patio. The kitchen is not big inside, but it is not really worth complaining about either. It’s big enough to cook a small meal, or an oven meal, while having your normal every day chunky-sized appliances on the counter (Keurig, Ninja, Soda Stream). 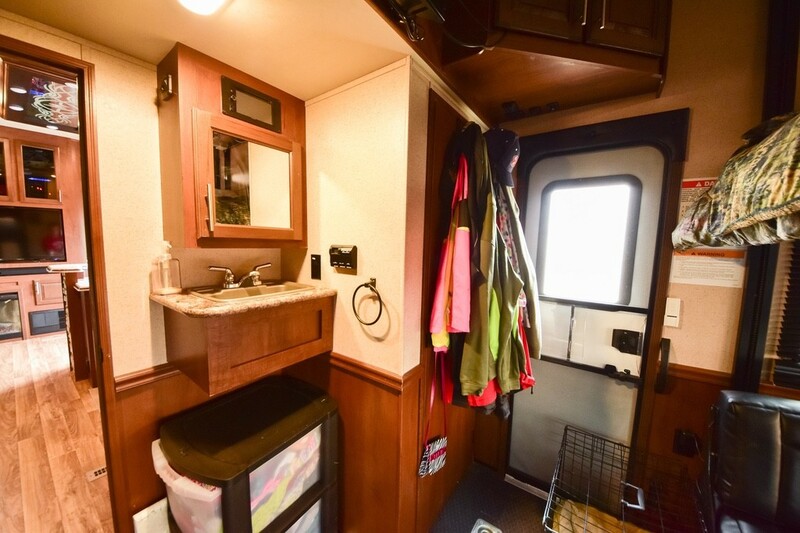 Since we are talking about the kitchen, let’s just address one of the top things you need to look for when buying a camper: Can you access the refrigerator with the camper enclosed? The refrigerator, yes. The freezer, no. This passes the test, but only by 1/2″ or so. Someone put some thought into the design, and it works. The refrigerator, given it is a residential refrigerator, is good for 1-2 weeks of food. The pantry is reasonable, but nothing to brag about when you give tours. If we combine the pantry with some space in the loft we are good for 2 weeks of food. Else, about a week. 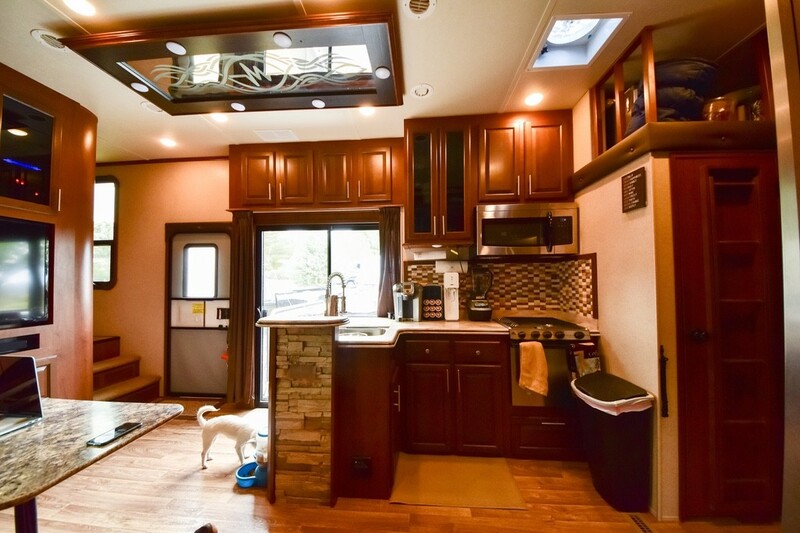 Huge improvement over most travel trailers and not a bad compromise to the no-kid RV models that have luxurious cabinet space everywhere. There is truly tons of storage in the kitchen for cooking pans, other small appliances, tupperware, etc. Even for your favorite appliance, pan or serving plate/bowl you use at Thanksgiving and Christmas only. You can bring it with you. Only negative about the kitchen: there isn’t a good place for the trash can. We just move ours out of the way a few times a day and don’t complain. There you have many highlights and a few weaknesses. Let’s address the greatest weaknesses. These are not unique to this model by any means. But weaknesses you need to consider if you are planning to go full-time and want to make this your permanent home. Shoes. Where do you put clean shoes let alone dirty shoes? Where do you put your easy-access Crocs so you can take the dogs potty without hunting for 5 minutes (which, at that point, you realize it would have been faster to put socks and tennis shoes on)? Kids’ clothing. If you want to keep them out of your bathroom, but you want them to access clothes without using a ladder in the main living area (the kids tend to bump roughly into cabinets in the process), where do you put their clothes? We use the loft, but this option may not work for larger families. Laptops. They are clunky, and need power every few hours. OSHA would not be happy to walk in on you in the middle of a work day. A desk would be good, but I have no idea where it would go. Again, just a piece of reality for you to visualize and prepare for. Kayaks. 14′ kayaks do not fit. 12′ may or may not fit, and you would have to place them on the non-bathroom side. Driving. You are huge, for sure. Get a 4×4 dually if you plan to venture outside of your well-exposed areas of comfort. Meaning, if you plan to go to new campgrounds and there is the slightest chance you will be on a road you do not know well – get the dually. Also, follow the truckers. Don’t go under any bridges that have less than a 13’6″ clearance. Site. This beast of a camper is definitely large. Pay special attention to state campgrounds, those in particular have short sites. Your truck may or may not fit at the campsite, so place your camper as far back or forward as you can. Park at an angle or be prepared to park in overflow and walk. Side patio. If you can put your awning out, you can put your side patio out. The only thing that would get in the way is a fixed item on the ground, like a bbq. I personally have never been to a campground that places permanent fixtures that would be under your awning. Boondocking. You are so very well equipped to boondock with the large onboard tanks for about 1 week. The generator is wonderful. Your roof is sturdy enough to walk on and large enough to add several solar panels. 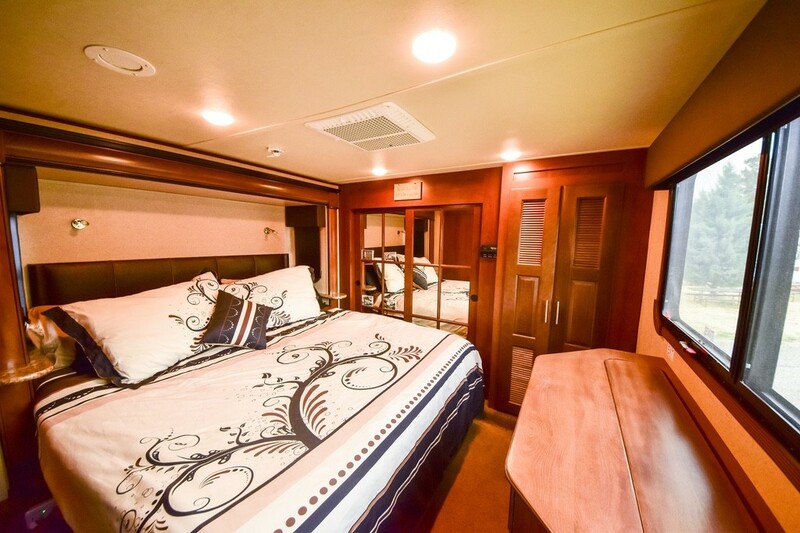 In conclusion, we love our Jayco Seismic 4212. There is no other model, regardless of price, we would choose given the fact we have kids and we like having additional transportation options. 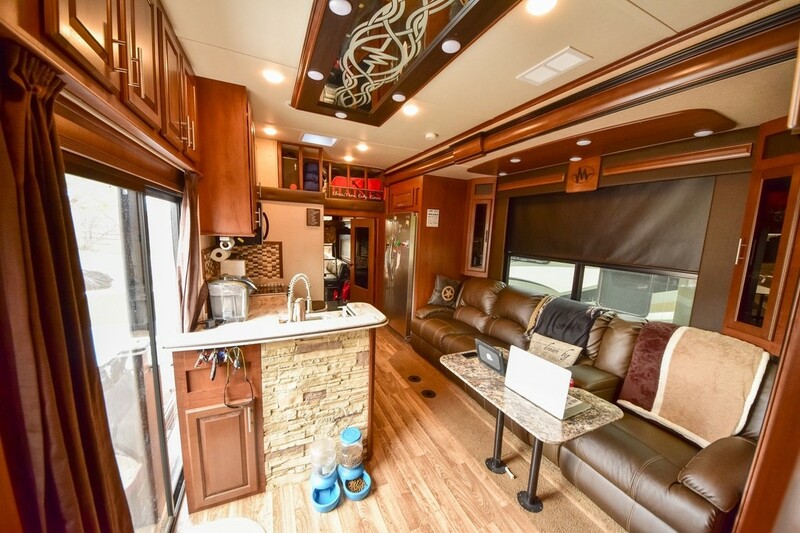 Take a tour of one and see for yourself! THANK YOU, JAYCO! Thank you for making such a perfect RV model. It’s awesome, and it sure helps make for a great camping experience. Why do you like the 4212 the best? I am trying to figure which floor plan to buy. Why do you like floor plan 4212? 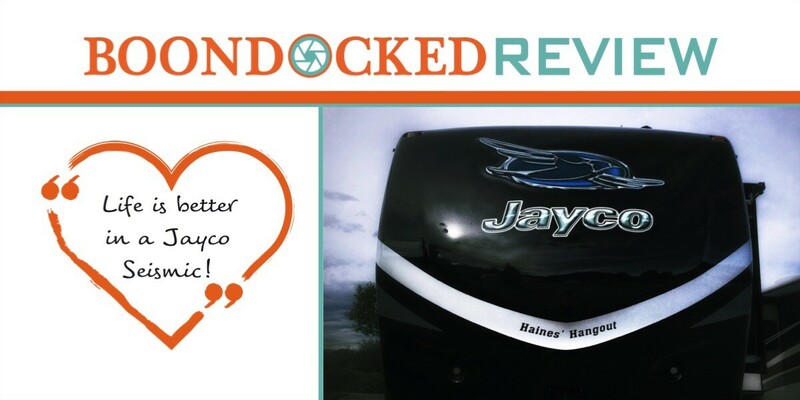 We’ve toured Seismic Jayco, High Country Montana, and Grand Design Momentum for 5th wheeler toy haulers and have seen multiple reviews for them. Yours is the best by far. I appreciate how you target the main uses a family would consider are important when looking for a camper. I also work from home and looking for a good solution when our family goes camping anytime and still be able to work from anywhere comfortably. I will definitely consider buying a Seismic Jayco now. You’ve answered lot of my concerns. I am looking forward on our upgrade to this great model! Can’t wait! !